It's time to celebrate Pi Day! Every year on March 14th (written 3/14 in the US), math-loving folks celebrate "all things pi-related" because 3.14 is the three-decimal approximation to the mathematical constant, π. Although children learn that pi is approximately 3.14159..., the actual definition of π is the ratio of a circle's circumference to its diameter. Equivalently, it is distance around half of the unit circle. (The unit circle has a unit radius, so its diameter is 2.) The value for pi, therefore, depends on the definition of a circle. But we all know what a circle looks like, don't we? How can there be more than one circle? This definition defines a distance metric for every value of p ≥ 1. If you set p=2 in the formula, you get the usual L2 (Euclidean) distance. If you set p=1, you get the L1 metric, which is known as the "taxicab" or "city block" distance. You might think that the Euclidean distance is the only relevant distance, but it turns out that some of these other distances have practical applications in statistics, machine learning, linear algebra, and many fields of applied mathematics. For example, the 2-norm (L2) distance is used in least-squares regression whereas the 1-norm (L1) distance is used in robust regression and quantile regression. A combination of the two distances is used for ridge regression, LASSO regression, and "elastic net" regression. Would the real circle please stand up? You can easily solve for y as a function of x and draw the unit circle for a representative set of values for p. The following graph was generated by the SAS step and PROC SGPLOT. You can download the SAS program that generates the graphs in this article. The L1 unit circle is a diamond (the top half is shown), the L2 unit circle is the familiar round shape, and as p gets large the unit circle for the Lp distance approaches the boundary of the square defined by the four points (±1, ±1). For more information about Lp circles and metrics, see the Wikipedia article "Lp Space: The p-norm in finite dimensions." Here comes the surprise: Just as each Lp metric has its own unit circle, each metric has its own numerical value for pi, which is the length of the unit semicircle as measured by that metric. So far, we've only used geometry, but it's time to use a little calculus. This presentation is based on Keller and Vakil (2009, p. 931-935), who give more details about the formulas in this section. To obtain a value for pi in the Lp metric, you can integrate the arclength for the upper half of the Lp unit circle. Equivalently, by symmetry, you can integrate one-eighth of the unit circle and multiply by 4. 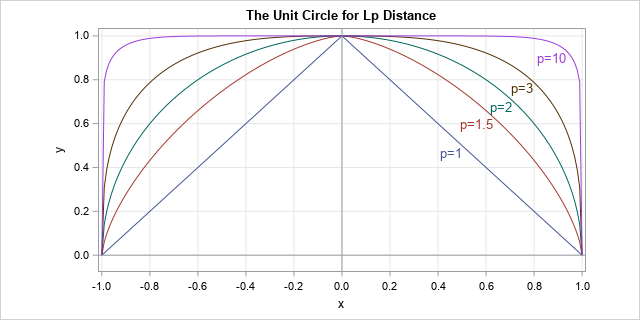 A convenient choice for the limits of integration is [0, 2-1/p] because 2-1/p is the x value where the 45-degree line intersects the unit circle for the Lp metric. π(p) = 4 ∫ (1 + u(x))1/p dx, where u(x) = |x-p - 1|1-p and the interval of integration is [0, 2-1/p]. For each value of p, you get a different value for pi. You can use your favorite numerical integration routine to approximate π(p) by integrating the formula for various values of p ≥ 1. I used SAS/IML, which supports the QUAD function for numerical integration. The arclength computation for a variety of values for p is summarized by the following graph. The graph shows the computation of π(p), which is the length of the semicircle in the Lp metric, versus values of p for p in [1, 11]. 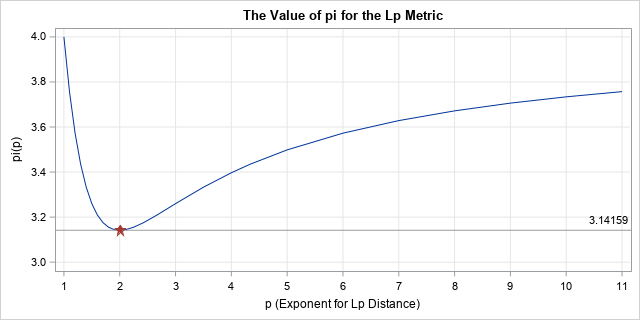 The graph shows that the L1 value for pi is 4. The value decreases rapidly as p approaches 2 and reaches a minimum value when p=2 and the value of pi is 3.14159.... For p > 2, the graph of π(p) increases slowly. You can show that π(p) asymptotically approaches the value 4 as p approaches infinity. If you ask me, our value of π is special, without a doubt! Download the SAS program that creates the graphs in this article. C. L. Adler and J. Tanton (2000) "π is the Minimum Value for Pi", The College Mathematics Journal, 31:2, 102-106. J. B. Keller and R. Vakil (2009) "πp, the Value of π in lp", The American Mathematical Monthly, 116:10, 931-935. The post The value of pi depends on how you measure distance appeared first on The DO Loop. A SAS programmer posted an interesting question on a SAS discussion forum. The programmer wanted to iterate over hundreds of SAS data sets, read in all the character variables, and then do some analysis. However, not every data set contains character variables, and SAS complains when you ask it to read the character variables in a data set that contains only numeric variables. ERROR: The variable _CHARACTER_ in the DROP, KEEP, or RENAME list has never been referenced. ERROR: No character variables in the data set. In both Base SAS and SAS/IML, you can use dictionary tables to determine in advance which data sets contain at least one character variable. You can then read only those data set. In SAS/IML, you can read all variables into a table, then extract the character variables into a matrix for further processing. Of course, the same ideas apply if you want to read only numeric variables and you encounter a data set that does not contain any numeric variables. The output shows that you can use the DICTIONARY tables to determine which data sets have at least one character variable. You can then use the USE/READ statements in PROC IML to read the character variables and process the data however you wish. As mentioned previously, this technique can also be used in PROC SQL and the DATA step. The output is identical to the output in the previous section. In summary, this article discusses a programmer who wants to iterate over many SAS data sets and process only character variables. However, some of the data sets do not have any character variables! This article shows two methods for dealing with this situation: DICTIONARY tables (available through Sashelp views) or SAS/IML tables. The first method is also available in Base SAS. Of course, you can also use this trick to read all numeric variables when some of the data sets might not have any numeric variable. I've previously written about how to read all numeric variables into a SAS/IML matrix by using the _ALL_ keyword. 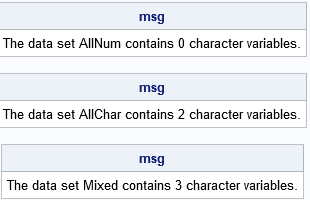 If the data set contains both numeric and character variables, then only the numeric variables are read. The SAS documentation contains a section about the section about dictionary tables and views. Eberhardt, P. and Brill, I. (2006), "An Introduction to SAS Dictionary Tables." Laffler, K. (2005), "Exploring DICTIONARY Tables and Views." The post How to detect SAS data sets that contain (or do not contain) character variables appeared first on The DO Loop. 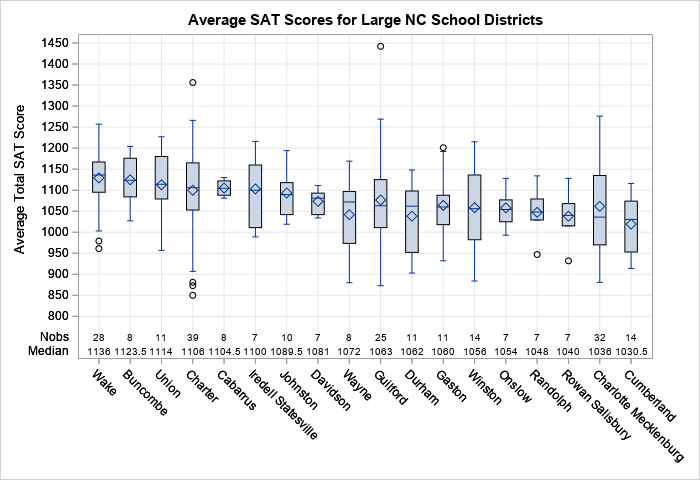 A previous article shows how to use a scatter plot to visualize the average SAT scores for all high schools in North Carolina. The schools are grouped by school districts and ranked according to the median value of the schools in the district. For the school districts that have many schools, the markers might overlap, which makes it difficult to visualize the distribution of scores. This is a general problem with using dot plots. An alternative visualization is to plot a box plot for each school district, which is described in today's article. The line in the middle of the box indicates the median score. A diamond marker indicates the mean score. The standard box plot extends the whiskers to observations that are within a distance D from the box, where D is 1.5 times the interquartile range. Other kinds of box plots are sometimes used. The SAS documentation explains the parts of a box plot. Box plots require a certain level of comfort with statistical ideas. Nevertheless, for a statistical audience, box plots provide a compact way to compare dozens or hundreds of distributions. When grouping box plots into categories, you can add headers, category dividers, and colors to help distinguish the categories. I demonstrated these so-called "nested box plots" in a previous blog post. When you want to display statistics about each box plot as a table inside the graph, the BOXPLOT procedure provides a simple syntax. You can use PROC SGPLOT to add a statistical table to a box plot, but you need to pre-compute the statistics and merge the statistics and the data. When you are plotting dozens or hundreds of box plots, the BOXPLOT procedure automatically splits the graph into a series of panels. 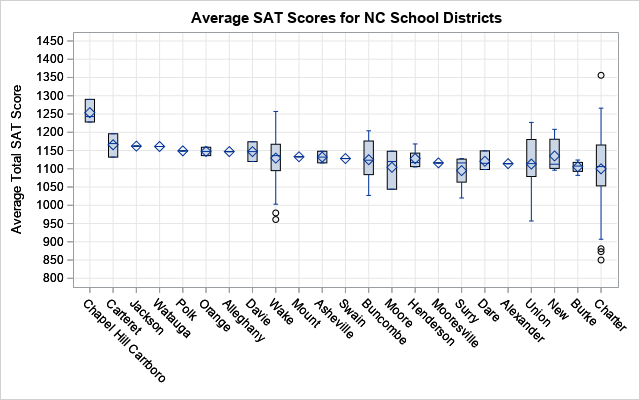 The second and third features are both useful for visualizing the SAT data for public high schools in NC. You can use the INSETGROUP statement in PROC BOXPLOT to specify statistics that you want to display under each box plot. For example, the following syntax displays the number of high schools in each district and the median of the schools' SAT scores. The WHERE clause filters the data so that the graph shows only the largest school districts (those with seven or more high schools). The graph shows schematic box plots for 18 large school districts. The districts are sorted according to the median value of the schools' SAT scores. The INSETGROUP statement creates a table inside the graph. The table shows the number of schools in each district and gives the median score for the district. The INSETGROUP statement can display many other statistics such as the mean, standard deviation, minimum value, and maximum value for each district. One of the coolest features of PROC BOXPLOT is that it will automatically create a panel of box plots. It is difficult to visualize all 115 NC school districts in a single graph. The graph would be very wide (or tall) and the labels for the school districts would potentially collide. However, PROC BOXPLOT will split the display into a panel, which is extremely convenient if you plan to print the graphs on a piece of paper. Because the districts are ordered by the median SAT score, the first plot shows the school districts with high SAT scores and the last plot shows districts with lower SAT scores. Districts that have only one school are shown as a diamond (the mean value) with a line through it (the median value). Districts that have two or three schools are shown as a box without whiskers. 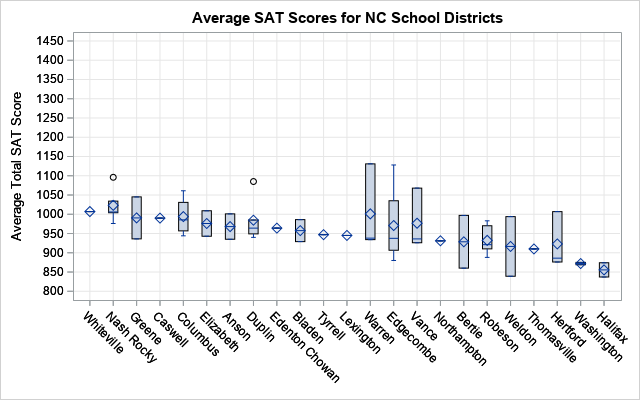 For larger school districts, the box plots show a schematic representation of the distribution of the schools' SAT scores. In summary, PROC BOXPLOT has several useful features for plotting many box plots. This article shows that you can use the INSETGROUP statement to easily add a table of descriptive statistics to the graph. The procedure also automatically creates a panel of graphs so that you can more easily look at dozens or hundreds of box plots. You can download the SAS program (NCSATBoxplots.sas) that creates the data and the graphs. The post Use PROC BOXPLOT to display hundreds of box plots appeared first on The DO Loop. In automated production (or business operations) environments, we often run SAS job flows in batch mode and on schedule. SAS job flow is a collection of several inter-dependent SAS programs executed as a single process. In my earlier posts, Running SAS programs in batch under Unix/Linux and Let SAS write batch scripts for you, I described how you can run SAS programs in batch mode by creating UNIX/Linux scripts that in turn incorporate other scripts invocations. In this scenario you can run multiple SAS programs sequentially or in parallel, all while having a single root script kicked off on schedule. The whole SAS processing flow runs like a chain reaction. However, sometimes we need to automatically stop and terminate that chain job flow execution if certain criteria are met (or not met) in a program of that process flow. Let’s say our first job in a batch flow is a data preparation step (ETL) where we extract data tables from a database and prepare them for further processing. The rest of the batch process is dependent on successful completion of that critical first job. The process is kicked off at 3:00 a.m. daily, however, sometimes we run into a situation when the database connection is unavailable, or the database itself is not finished refreshing, or something else happens resulting in the ETL program completing with ERRORs. This failure means that our data has not updated properly and there is no reason to continue running the remainder of the job flow process as it might lead to undesired or even disastrous consequences. In this situation we want to automatically terminate the flow execution and send an e-mail notification to the process owners and/or SAS administrators informing them about the mishap. We want to run tail.sh shell script (which itself runs multiple other scripts) only if etl.sas program completes successfully, that is if SAS ETL process etl.sas that is run by etl.sh completes with no ERRORs or WARNINGs. Otherwise, we want to terminate the main.sh script and do not run the rest of the processing flow. Then the optional echo command just prints the captured value of that status for our information. Every UNIX/Linux command executed by the shell script or user has an exit status represented by an integer number in the range of 0-255. 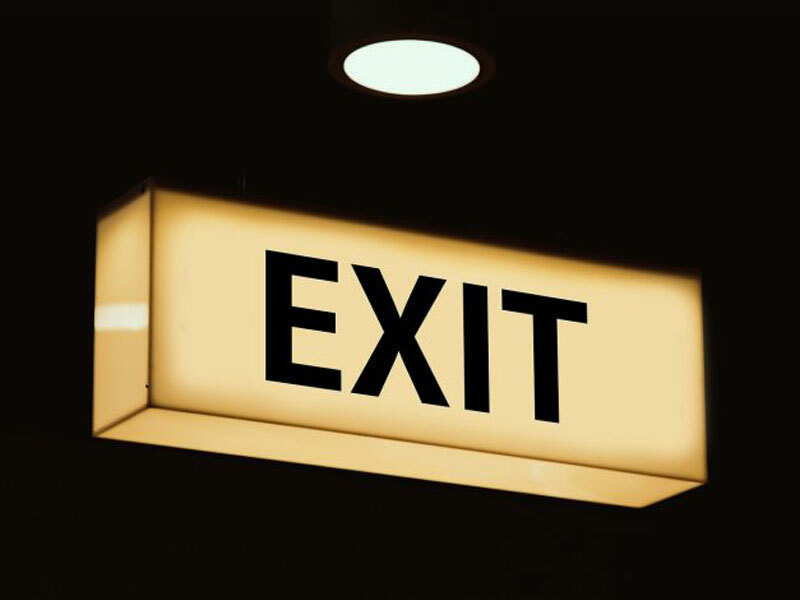 The exit code of 0 means the command executed successfully without any errors; a non-zero value means the command was a failure. Since our etl.sh script executes SAS code etl.sas, the exit status code is passed by the SAS System to etl.sh and consequently to our main.sh shell script. Then, in the main.sh script we check if that exit code equals to 0 and then and only then run the remaining flow by executing the tail.sh shell script. Otherwise, we skip tail.sh and exit from the main.sh script reaching its end. In this shell script code example, we check the exit return code value, and if it is NOT equal to 0, then we explicitly terminate the main.sh shell script using exit command which gets us out of the script immediately without executing the subsequent commands. In this case, our #2 command invoking tail.sh script never gets executed that effectively stops the batch flow process. That is immediately after the email is sent, the shell script and the whole batch flow process gets terminated by the exit command; no shell script commands beyond that if-statement will be executed. Then the $? variable in the if [ $? -ne 0 ] statement will have the value of the previous echo command, not the /stas/code/etl/etl.sh command as you might imply. Hence, I suggest capturing the $? value in an interim variable (e.g. exitcode=$?) right after the command, exit code of which you are going to inspect, and then reference that interim variable (as $exitcode) in your subsequent script statements. That will save you from trouble of inadvertently referring to a wrong exit code when you insert some additional commands during your script development. What do you think about this approach? Did you find this blog post useful? Did you ever need to terminate your batch job flow? How did you go about it? Please share with us. How to conditionally terminate a SAS batch flow process in UNIX/Linux was published on SAS Users.